New data from the Census Bureau show that the nation’s immigrant population (legal and illegal), also referred to as the foreign-born, reached 40 million in 2010, the highest number in American history. Nearly 14 million new immigrants (legal and illegal) settled in the country from 2000 to 2010, making it the highest decade of immigration in American history. This is the case even though there was a net decline of jobs during the decade. 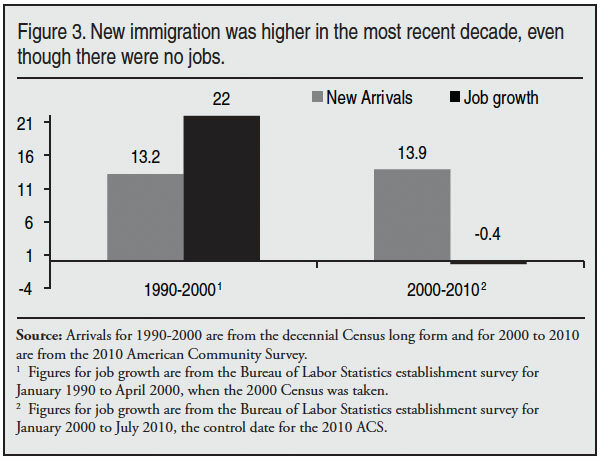 In contrast, from 1990 to 2000 job growth was 22 million and 13.2 million new immigrants arrived. Immigrants come for many reasons, such as a desire to join relatives or to access public services. As a result, immigration remains high even during a prolonged period of economic weakness. The nation’s immigrant population (legal and illegal) reached 40 million in 2010, the highest number in the nation’s history. The nation’s immigrant population has doubled since 1990, nearly tripled since 1980, and quadrupled since 1970, when it stood at 9.7 million. Of the 40 million immigrants in the country in 2010, 13.9 million arrived in 2000 or later making it the highest decade of immigration in American history, even though there was a net loss of jobs during the decade. New arrivals are offset by out-migration and deaths. As a result, the net increase in the immigrant population was more than 8.8 million over the last decade, from 31.1 million in 2000. While the number of immigrants in the country is higher than at any time in American history, the immigrant share of the population (12.9 percent) was higher 90 years ago. Growth in the immigrant population has primarily been driven by high levels of legal immigration. Roughly three-fourths of immigrants in the country are here legally. Immigrants continue to head to non-traditional states of settlement. The six states with the largest immigrant populations accounted for 65 percent of the total in 2010, 68 percent in 2000, and 73 percent in 1990. Overall the immigrant population grew 28 percent between 2000 and 2010. But it grew at more than twice the national rate in: Alabama (92 percent), South Carolina (88 percent), Tennessee (82 percent), Arkansas (79 percent), Kentucky (75 percent), North Carolina (67 percent), South Dakota (65 percent), Georgia (63 percent), Indiana (61 percent), Nevada (61 percent), Delaware (60 percent), Virginia (60 percent), and Oklahoma (57 percent). Since 1990 the immigrant population has doubled. It grew at more than twice the national rate in: North Carolina (525 percent), Georgia (445 percent), Arkansas (430 percent), Tennessee (389 percent), Nevada (385 percent), South Carolina (337 percent), Kentucky (312 percent), Nebraska (298 percent), Alabama (287 percent), Utah (280 percent), Colorado (249 percent), Minnesota (235 percent), Delaware (223 percent), Iowa (222 percent), Indiana (219 percent), Oklahoma (215 percent), and Arizona (208 percent). States with the largest numerical increases over the last decade were: California, Texas, Florida, New York, New Jersey, Georgia, Virginia, North Carolina, Maryland, Washington, Illinois, Pennsylvania, and Massachusetts. 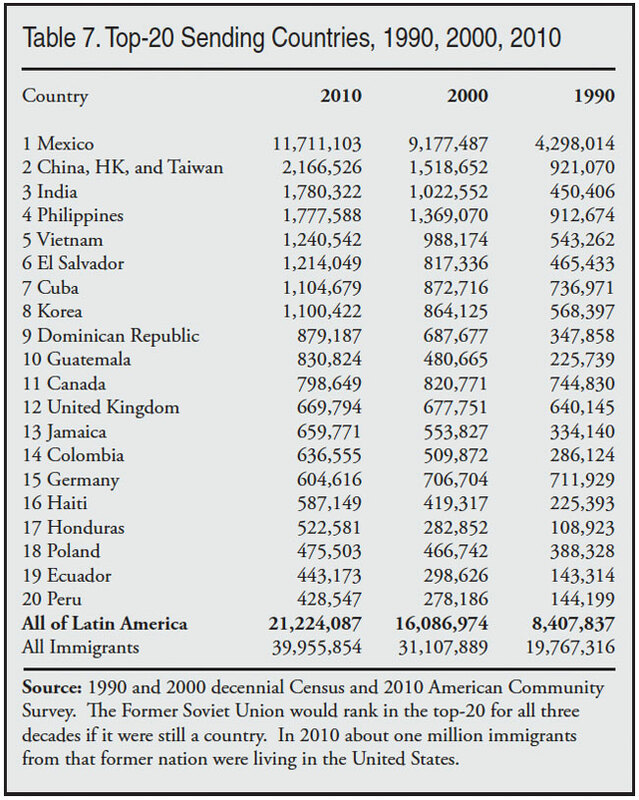 Latin America continued to dominate immigration. Countries from this region accounted for 58 percent of the growth in the immigrant population from 2000 to 2010. With nearly 12 million immigrants, Mexico was by far the top immigrant-sending country, accounting for 29 percent of all immigrants and 29 percent of growth in the immigrant population from 2000 to 2010. Other countries have also seen significant growth in their populations. In 1990 there was only one sending-country with more than one million immigrants in the United States, by 2000 there were four such countries, and in 2010 there were eight. The median age of immigrants in 2010 was 41.4 compared to 35.9 for natives. The nation’s economic performance over the last decade has been described as a “lost decade” for jobs. Between 2000 and 2010, the number of jobs in the United States actually declined. In terms of immigration, however, the number of new immigrants and the overall size of the immigrant population both set new records. In contrast, from 1990 to 2000 job growth exceeded 20 million, yet fewer immigrants actually arrived during that decade. This does not mean that immigration is entirely unconnected to the U.S. job market. But these figures are a reminder that immigration levels are not as tightly linked to the economy as some have imagined. Such factors as the desire to access public services, or to enjoy greater political freedom or to join relatives in the United States significantly impact migration. And these things are unaffected by the U.S. economy. As already discussed, the data for this Backgrounder come primarily from the ACS collected by the Census Bureau. The ACS has become one of the primary sources of data on the size and growth of the nation’s immigrant population. The ACS samples roughly 4.5 million individuals. In this report, the terms foreign-born and immigrant are used synonymously. Immigrants are persons living in the United States who were not American citizens at birth. This includes naturalized American citizens, legal permanent residents (green card holders), illegal aliens, and people on long-term temporary visas such as foreign students or guestworkers, who respond to the ACS. It does not include those born abroad of American parents or those born in outlying territories of the United States such as Puerto Rico. There is research indicating that some 5 percent of the immigrant population is missed by Census Bureau surveys of this kind.4 If correct, then the overall foreign-born population stood at 42 million in 2010. Overall Numbers. 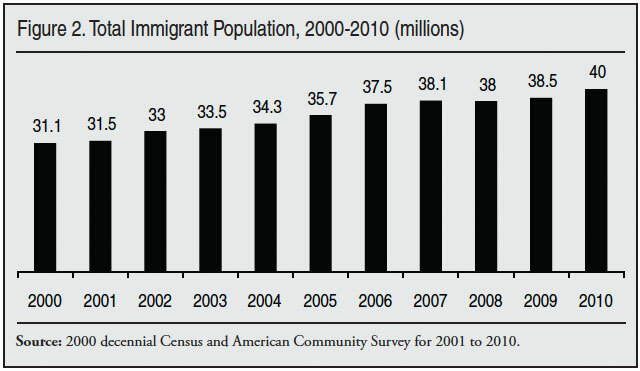 Figure 1 reports the immigrant population in the United States from 1990 to 2010. The bars show the number in millions and the line shows the share of the U.S. population that is immigrant. The figure shows that the size and growth of the immigrant population varied significantly over the last 110 years. The total immigrant population of 40 million in 2010 is much higher than at any other period of American history. This population has grown dramatically in recent decades; doubling since 1990, nearly tripling since 1980, and quadrupling since 1970. This dramatic growth is striking, because the only way the immigrant population can grow is through new arrivals. By definition, no one born in the United States is foreign-born and so births cannot add to the immigrant population. Moreover, each year some immigrants die, and others return home. There is some debate about the size of out-migration, but combined deaths and return-migration together equal 1-2 percent of the immigrant population annually or 300,000 to 800,000 each year over the last decade.5 As will be discussed later, for the immigrant population to have actually increased by more than 8.8 million from 2000 to 2010, new immigration must greatly exceed this net growth. In addition to the number of immigrants, Figure 1 also shows the share of the U.S. population that is foreign-born. The foreign-born share has grown significantly, though not as dramatically as the number of immigrants because the overall size of the U.S. population has increased substantially. In 2010, 12.9 percent of the population, or about one out of eight people in the United States, were foreign-born. The immigrant share of the U.S. population has increased two-and-a-half fold since 1970, when it was 4.7 percent. Figure 1 shows that the foreign-born percentage of the population was higher than it is today from 1900 to 1930, while it has been lower in every census since then. Figure 2 reports growth in the foreign-born population from 2000 to 2010 based on the ACS. The survey shows significant growth throughout the decade. The figure for 2000 is from the decennial census because the ACS was not fully implemented until 2005.6 Therefore, for 2000 we use the decennial census. Because the ACS was not fully implemented until 2005, it is better to compare 2000 and 2005 and individual years after 2005, then to examine growth using the 2001 to 2004 ACS.7 Figure 2 shows a significant fall off in the growth of the immigrant population from 2007 to 2009, with an increase of only 400,000 over that two-year period. This slowing in the growth likely reflects a reduction in the number of new immigrants (legal and illegal) settling in the country and an increase in out-migration. New Arrivals. Figures 1 and 2 show that the immigrant population grew dramatically in the last decade. For this to have occurred, the number of new arrivals must also have been high. In addition to asking respondents if they are immigrants, the ACS also asks them what year they came to the United States to live. Of the 40 million immigrants in the country in 2010, 13.9 million (±99,000) responded that they came to the United States in 2000 or later. That is, 13.9 million immigrants were in the country in 2010 who had come to the United States between 2000 and 2010.10 Of course, some of the immigrants who arrived during the decade would have died or returned home by 2010, so the actual level of new arrivals is somewhat higher. The reason that the immigrant population did not grow by 13.9 million is that roughly five million immigrants died or went home over this time period so the net change was slightly more than 8.8 million. Figure 4 reports new arrivals based on the ACS from 2000 to 2009. It also reports the unemployment rate for immigrants during the decade. It must be emphasized that individual year of arrival data are not yet available from the 2010 ACS. The figure of 1.7 million for 2009 is an estimate based on other information in the 2010 data.14 Therefore, the 1.7 million new arrivals in 2009 must be interpreted with caution. When figures for individual year of arrival become available from the 2010 public use of the ACS, that number will need to be revised. Although the arrival data support this figure, 1.7 million arrivals seems implausibly high. On the other hand, for the immigrant population to grow by 1.4 million between 2009 and 2010 (see Figure 2), the number of new arrivals would have be to several hundred thousand higher than 1.4 million because of the deaths and return migration that take place each year. Overall, Figure 4 shows that unemployment does seem to impact immigration levels. However, the figure also shows that the level of new immigration can remain very high even when unemployment increases significantly for immigrants. The above figures are a reminder that immigration is a complex process; and it is not simply a function of labor-market conditions. Such factors as the desire to be with relatives or to enjoy the political freedoms and lower levels of official corruption play a significant role in the decision to come to the United States. The generosity of America’s public benefits and the quality of public services can also make this country an attractive place to settle. These things do not change during a recession, even a steep one. Moreover, the employment and wages available in the United States may still be much better than in many of the primary immigrant-sending countries, even during a severe economic downturn or a prolonged period of weak job growth such as the past decade. It is also important to understand that immigration is driven in part by social networks of friends and family who provide information about conditions in the United States to those back home, which both makes them more aware of opportunities in the United States and more likely to come. Also, new immigrants often live with friends who can assist new immigrants after they come. Thus, as the immigrant population grows, it creates its own momentum for more immigration. As a result, immigration can remain very high even if there is no job growth. This does not mean that economic factors are unimportant. But the fact that more immigrants arrived in the first decade of the 21st century than in the previous decade is a clear indication that factors other than the state of the U.S. economy matter a great deal. State Data. Tables 1 through 5 show state data. 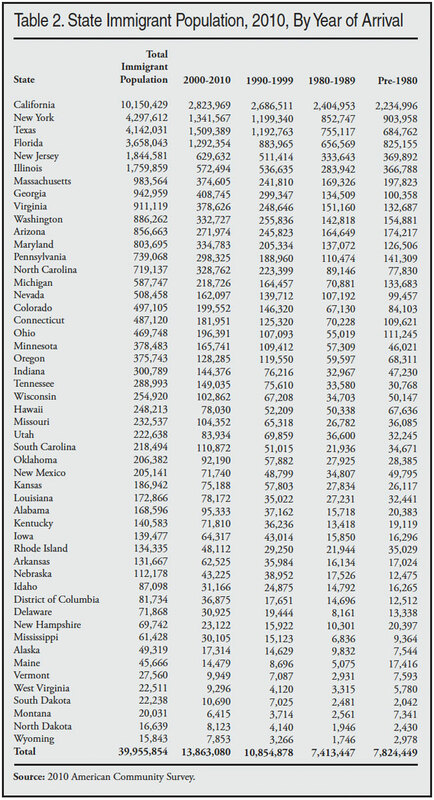 Table 1 shows the number of immigrants in each state for 2010. California, New York, Texas, Florida, New Jersey, Illinois, Massachusetts, Georgia, Virginia, Washington, Arizona, and Maryland have the largest immigrant populations. Each of these states had more than 800,000 foreign-born residents in 2010. California has the largest immigrant population, accounting for more than one-fourth of the national total. New York and Texas are next, with about 10 percent of the nation’s immigrants. With 9 percent of the nation’s immigrants, Florida’s foreign-born population is similar in size. New Jersey and Illinois are next, with five and four percent of the nation’s immigrants respectively. 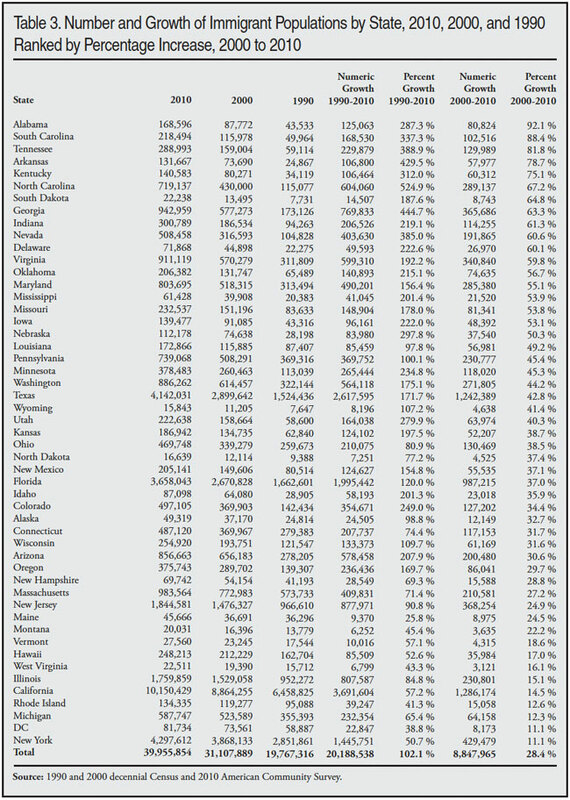 Table 1 shows that the immigrant population is concentrated in only a few states. These six states account for 65 percent of the nation’s foreign-born population, but only 40 percent of the nation’s overall population. As a share of their populations, many of the states with the largest immigrant populations are also those with the highest foreign-born shares. However, several smaller states such as Hawaii and Nevada rank high in terms of the percentage of their populations that are foreign born, even though the overall number of immigrants is more modest relative to larger states. Table 2 shows the immigrant populations by state based on their year of arrival grouped by decade. 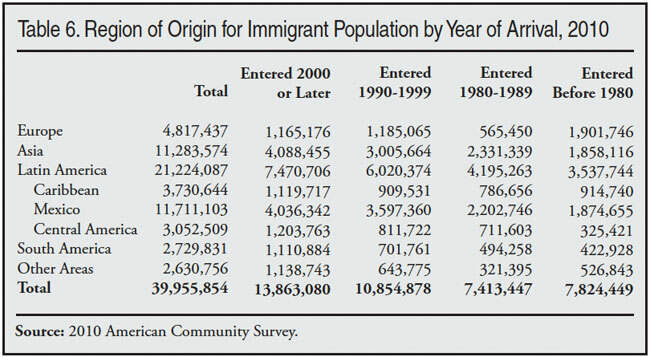 Table 3 reports the size of state immigrant populations in 2010, 2000, and 1990. Table 3 shows that while the immigrant population remains concentrated, it has become less so over time. In 1990, California accounted for 33 percent of the foreign-born, but by 2000 it was 28 percent, and by 2010 it was 25 percent of the total. If we look at the top-six states of immigrant settlement, they accounted for 73 percent of the total foreign born in 1990, 68 percent in 2000 and 65 percent in 2010. There were 13 states where the growth in the immigrant population was more than twice the national average of 28 percent over the last decade. These states were Alabama (92 percent), South Carolina (88 percent), Tennessee (82 percent), Arkansas (79 percent), Kentucky (75 percent), North Carolina (67 percent), South Dakota (65 percent), Georgia (63 percent), Indiana (61 percent), Nevada (61 percent), Delaware (60 percent), Virginia (60 percent), and Oklahoma (57 percent). It is worth noting that the growth rate in California, the state with the largest immigrant population, was only about half the national average. Table 3 makes clear that the nation’s immigrant population has grown very dramatically outside of traditional areas of immigrant settlement, such as California. Countries. Table 6 shows some of the regions of the world by year of arrival. Mexico was by far the top-sending country in the last decade with more than four million immigrants from that country arriving between 2000 and 2010. Table 7 reports the countries with the most immigrants in the United States in 2010. It also shows those same countries in 2000 and 1990. Overall, the 2.5 million increase in the size of the Mexican population accounted for 29 percent of the growth in the foreign-born, a share consistent with that nation’s overall share of the immigrant population. Latin America continued to dominate immigration in the last decade. Countries from this region accounted for 58 percent of the growth in the immigrant population from 2000 to 2010. The immigrant populations from many countries have grown significantly. In 1990 only one country had more than one million immigrants in the United States. In 2000 there were four such countries, and by 2010 there were eight countries with more than one million immigrants in the United States. This report examines just-released Census Bureau data collected in 2010 showing that the nation’s immigrant population reached 40 million in 2010, the highest level in American history. The same data also show that 13.9 million immigrants (legal and illegal) arrived in the United States between 2000 and 2010, making it the highest decade for immigration in the nation’s history. This compares to 13.2 million arrivals from 1990 to 2000. This is a striking finding because the number of new arrivals in the decade just completed is higher than the decade prior to the 2000 Census, yet the two decades were fundamentally different in terms of job growth. There were two significant recessions between 2000 and 2001, plus the September 11 terrorist attacks. In fact, there was no job growth for large parts of the decade and, in fact, there was an overall net loss of jobs from January 2000 to the middle of 2010. The finding that immigration was so high in the first decade of the 21st century is important because it is a reminder that immigration is a complex process; and it is not simply a function of labor-market conditions in this country. Many factors influence migration decisions, such as the desire to be with relatives, the political freedoms in this country, and the generosity of American public services. These things do not change, even during a prolonged period of economic stagnation such the decade just completed. It is also important to understand that immigration is driven in part by social networks of friends and family who provide information about conditions in the United States and often help new immigrants after they arrive. As the immigrant population grows, it creates pressure for more immigration. As a result, the level of new immigration remained high, even in the face of a weak job market. The new data also show that the immigrant population continues to grow outside of traditional areas of immigrant settlement. Between 2000 and 2010 there were 13 states where the immigrant population grew by more than twice the national average of 28 percent. In addition, Latin American countries continue to dominate the flow of immigrants into the United States, accounting for 58 percent of the growth in the foreign-born population between 2000 and 2010. Absent a change in policy, new immigration will likely continue at very high levels. In fact, there is evidence that immigration levels have already begun to increase. 2 The ACS is a July 1st estimate of the U.S. population, while the Census is for April 1. This means that the arrival data in the 2010 ACS is for January 2000 to July 2010 and arrival data for the decade prior to 2000 in the Census is from January 1990 to April 2000. Those three additional months in the ACS would tend to add slightly to the number of new arrivals. However, they cannot account for the higher number from the 2010 data because three extra months could only add perhaps 300,000-400,000 new arrivals to the 2010 ACS compared to the 2000 Census. The margin of error for 13.9 million arrivals from 2000-2010 in the new ACS is only ±99,000. Thus, even if 400,000 is added to the 1990-2000 arrivals found in the 2000 Census, the difference between the two decades would still be statistically significant. The year of arrival data from the 2000 Census come from the so-called “long-form” questions. Prior to the 2010 Census, about 15 percent of the population was sent a detailed questionaire along with the standard Census questions. The detailed questions were referred to by the Census Bureau as the long form. The long form included questions on citizenship and year of arrival. The 2010 Census did not include any long-form questions. The ACS is explicitly designed to replace the long-form questions. Historic Census data by year of entry can be found at http://www.census.gov/population/www/documentation/twps0029/twps0029.html. 3 Figure based on year-of-arrival data in the 1990 census. 4 For the post-1980 immigrant population, the Department of Homeland Security estimates a 5 percent undercount in the ACS. See “Estimates of the Unauthorized Immigrant Population Residing in the United States: January 2010”, at http://www.dhs.gov/xlibrary/assets/statistics/publications/ois_ill_pe_20.... The Pew Hispanic Center comes to a similar conclusion in their analysis of the Current Population Survey. See “Trends in Unauthorized Immigration: Undocumented Inflow Now Trails Legal Inflow”, October 2008, at http://pewhispanic.org/files/reports/94.pdf. 5 Given the age, gender, race, and ethnic composition of the foreign-born population, the death rate over the last decade should be about seven per 1000. This means that the number of deaths over the last decade varied from 217,000 a year at the start of the decade to nearly 266,000 by the end of the decade. There is debate over the issue of emigration. However, if there were ~2.4 million deaths among the foreign-born during the decade, ~13.9 million new arrivals and growth of ~8.8 million, then this implies emigration of ~2.6 million during the decade. 6 In 2000, the ACS was called the Census 2000 Supplemental Survey and it showed 30.3 million immigrants. 7 The ACS did not add those living in group quarters like prisons or nursing homes until 2006. 8 See for example, “Immigration and Economic Stagnation: An Examination of Trends 2000 to 2010”, November 2010, at http://cis.org/highest-decade. See also “Homeward Bound: Recent Immigration Enforcement and the Decline in the Illegal Alien Population”, July 2008, at http://cis.org/trends_and_enforcement, and “A Shifting Tide: Recent Trends in the Illegal Immigrant Population”, July 2009, at http://www.cis.org/IllegalImmigration-ShiftingTide. 10 It is worth noting that the Current Population Survey (CPS), which is also collected by the Census Bureau, shows a significantly smaller number of immigrants. The CPS for March 2010 (also referred to as the Annual Social and Economic Supplement) shows 37.6 million foreign-born residents and 13.1 million arrivals 2000 to 2010. The CPS does not include persons in institutions, as does the ACS, so this partly accounts for the difference. Moreover, the CPS is a March total not July, as is the ACS, and the CPS uses a slightly different weighting scheme from the ACS. In recent years the CPS has produced lower estimates of the foreign-born than the ACS. However, 2.4 million is a large difference. In general, the ACS has come to be seen as the more reliable source for the size of the immigrant population because it is a much larger sample than the CPS. 11 See Note 2 for a discussion of the ACS and the decennial census. 12 Starting in 1970, the Census began to ask the year of arrival question so arrival by decade is available for the 1960s forward. Administrative data on legal immigration goes back to 1820 and shows that no decade comes close to the nearly 14 million immigrants who arrived from 2000 to 2010. 13 If we line up the arrival data with job growth and compare January 1990 to April of 2000 (the date of the Census), job growth was 22 million. If we compared January 2000 to July 2010 (the control data for the ACS) we find a decline of 425,000 jobs. In a previous study we reported a net decline of over a million jobs from 2000 to 2010 and a net gain of some 21 million from 1990 to 2000. That study, “Immigration and Economic Stagnation: An Examination of Trends 2000 to 2010”, used the year of arrival data from the Current Population Survey, which is taken in March. The Census is taken in April and the ACS is weighted to reflect the population in July. Although the months compared in that earlier study were different, resulting in somewhat different job figures, the basic conclusion is exactly the same. Immigration was higher between 2000 and 2010 compared to between 1990 and 2000, even though the economy was fundamentally different in each decade. Historical data from 1994 to the present can be found at http://www.bls.gov/schedule/archives/empsit_nr.htm#2010. Figures for January 1990 can be found in the November 1990 issue of Monthly Labor Review, at http://www.bls.gov/opub/mlr/1990/11/rpt1full.pdf. 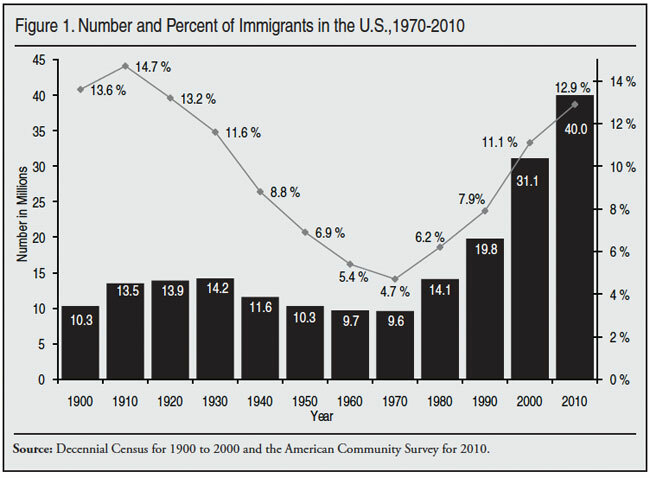 14 The Census Bureau has released data from 2010 showing the arrival of immigrants grouped by decade. The 2010 ACS shows 13.9 million individuals in 2010 who indicated that they arrived between 2000 and 2010. 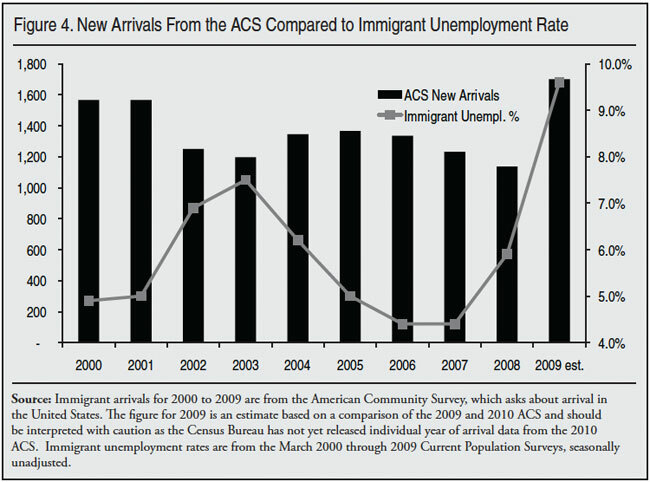 The 2009 ACS showed 12.2 million immigrants who arrived from 2000 to 2009. If we subtract these two numbers we can estimate the number of new arrivals in 2009 or, more accurately, arrivals between the middle of 2009 and the middle of 2010. It must be emphasized that this approach is only an indirect approximation of new immigration. More precise figures for 2009 will have to wait until the ACS public-use data are released.